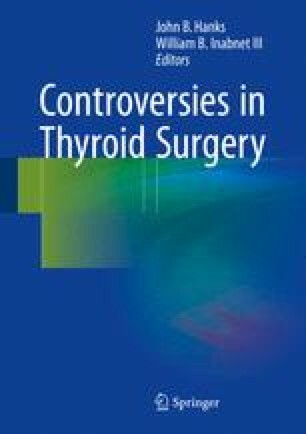 Thyroidectomy is the most commonly performed endocrine surgery in the world and is regularly accomplished safely with a very low complication profile. Despite the excellent medical outcomes routinely achieved in thyroid surgery, the procedure may result in a cosmetically objectionable anterior neck scar in some patients. In an effort to reduce the cosmetic impact of thyroid surgery, remote access approaches which completely eliminate the risk of a visible neck scar by moving the incision to a more distant, concealed location have been developed and are receiving increasing international attention. These efforts have been facilitated by incorporating the robotic surgical platform into remote access surgery; this has led to the development of the robotic axillary and robotic facelift thyroidectomy (RFT) procedures. While axillary portal approaches, including the bilateral axillo-breast approach (BABA), have been adopted in many Asian markets, they have not been uniformly embraced in Western practices for a number of different reasons. Attempts to reproduce the transaxillary approach in the United States resulted in widespread major complications, including severe blood loss, brachial plexus injury, and tracheal perforation [1–3]. The postauricular (or facelift) approach has emerged as an easier and less invasive alternative for a Western population . Therefore, in appropriately selected patients who are motivated to avoid a visible neck scar, these procedures continue to offer an attractive alternative to anterior cervical thyroidectomy approaches.